If you are lengthening or shortening an item with horizontal stripes or horizontal patterning, you should make sure that you are happy with where the patterning will begin or end. If your length alteration affects the armscye for a set-in or modified drop-shoulder sleeve, then you will need to recalculate the instructions for the sleeve cap. However, upper front and back length alterations to a drop shoulder sweater do not necessary require that the sleeve be reshaped. If your length alteration also results in making the sleeve narrower, make sure the sleeve does not wind up being too tight. Even these tricky bits about length adjustments are easily handled with a little bit of forethought. But changing the width of a garment is a different matter. Although it depends on the amount of alteration required, it's generally more challenging to adjust somebody else's knitting pattern in this dimension. Why? If you needed to adjust the width of these tops, where can you add or remove that extra width without distorting the fit of the rest of the garment? At the side edges, shoulders, neckline, or some combination of the three? - The pattern may lack sufficient finished measurement information (or a schematic) for computing width alterations. - The pattern may lack information about the appropriate amount of wearing or design ease. - Just because you need to add or subtract width in one part of the garment doesn't mean that you need to make that same adjustment everywhere else. - The adjustment you need to make might require adjustments in more than one place. - You may have chosen the wrong pattern size as your starting point. - The alteration you wish to make is not merely a fitting adjustment; it's a style change. Some of these factors, such as a lack of pattern measurements or ease information, simply aren't your fault, but you can correct them. The last two factors are within your control, and can make the difference between a successful alteration and throwing your calculator at the wall. For a set-in sleeve style, pick the size with the cross-shoulder measurement that fits you best for the design style. That way, you won't have have to fuss with widening or narrowing the shoulders. This also means that even if there's a finished bust measurement that looks perfect for you, don't use it if the shoulders won't fit! Generally, it's easier to tweak the size of a garment around the torso than it is to adjust the upper body width. For a raglan sleeve style, pick the size with the full bust measurement that fits you best for the design style, provided the armhole depth is sufficiently deep to be comfortable. The raglan style doesn't have a defined shoulder line, so fitting the shoulder is usually less crucial; the biggest fitting problem is usually the armhole depth. Usually, the armhole depth will be just fine, but sometimes (especially in body-conscious styles), it might be on the shallow side, and potentially tight and uncomfortable. However, raglan yoke shaping lends itself to easy armhole depth adjustments, so it's generally safe to pick the size that matches your target bust measurement, and alter the armhole depth if necessary. Your cross-shoulder measurement is the distance between your shoulder points. But where is your shoulder point, anyway? It's hard to find the bony mass that so many knitting references mention. The shoulder point is not the exterior of your upper arm, and it's not the protruding bit of your clavicle that sticks up; it's somewhere in between, and a fair estimate is halfway between those two reference points. The cross-shoulder measurement is the distance between these two shoulder points, measured from the front. As you age and gain (or lose) weight, this measurement will stay fairly constant, and in reality the variation in this measurement across women's sizes is less than current knitting standards might have you believe. The real-life variations in fit at the shoulder are due more to the amount of flesh on people's frames than on the bones themselves. For a drop-shoulder style, pick the size with the full bust measurement that fits you best for the design style. Most drop-shoulder styles are designed with generous ease and significant differences between adjacent sizes, so it's not too hard to identify the right pattern size. For a modified drop-shoulder style where the sleeve-body seam is dropped and falls across the upper arm, pick the size with the full bust measurement that fits you best for the design style. If the sleeve-body seam does fall at the shoulder, then treat it like the set-in sleeve style, and choose the size that puts the sleeve-body seam in the right place. In other words, if the garment style relies on a sleeve-body seam falling in just the right location, choose the size that makes this work on your body so that you can avoid having to make adjustments to the upper body. Otherwise, if you have to make alterations in that area, then not only do you have to worry about armscye depth and decreases, but you might have to rejig the shoulder slope and neck opening. Previously, we've discussed how to pick the right starting size. If you've forgotten about that in the meantime, it might be a good idea to go back and read it, because we're going to pick up right where that left off. From here on in, we're going to assume that you've already picked out the best pattern size as a starting point. Hopefully, the pattern may include some information on ease, which is important in helping you pick the right size to begin with. Without it, you're reliant on the subtle clues that might have been provided in the finished measurements, the accompanying photographs, and what pattern writer's idea of a size small/medium/large/etc. might be. Is the garment supposed to be roomy? If the schematic suggests a loose fit, but it looks tight on the model, read through the pattern to see if there's an explanation: perhaps part of the garment is gathered, tied, or laced up. You need to recognize what kind of "adjustment" you're making to the pattern: do you really just want to tweak it to fit your body shape, or is your intention to change the style? These are two different types of alteration. If you just want to add a couple of inches to the finished bust measurement because your target finished size is between two pattern sizes, or if you just need to size the pattern up or down because the pattern sizes aren't quite large or small enough, that's probably just a size alteration. Certainly both types of alteration will involve some kind of width adjustement, but changing the garment style is a significantly bigger undertaking; in some cases, it's easier to simply start from scratch rather than alter an existing pattern. In the meantime, we'll focus on the easier tasks: adjusting a pattern when you're between two sizes, or increasing or decreasing a size or two beyond the pattern's size range. Having picked out the correct starting size in the pattern, the next step is to figure out what kind of alteration is necessary. For this, we'll work through a series of exercises. Our fit model for this exercise, and the first pattern to be adjusted. While the patterns we adjust may be close-fitting, We will assume that the pattern will have the typical proportions of a hand knitting pattern: the widths of the front and back pieces at all points are equal (e.g. full bust measurement, shoulders, hips). Recall that pattern schematics show flat dimensions: a hip measurement across the front of 18 inches corresponds to a 36 inch circumference. As you can see, our pattern here has a finished bust measurement of 36 inches [91.5 cm] (which is twice width of the front, shown in the pattern schematic at right), but the hips are the same dimension: a touch too narrow for 38 inch [96.5 cm] hips. While it's still wearable, it will have to stretch to fit the wearer's hips. You'll often find that in hand knitting patterns with waist shaping, the circumference of the garment at the hem is often very close, or equal, to the circumference at the bust. The shape of the garment body thus resembles an hourglass, like the schematic of our pattern above. On real bodies, hips and full bust measurements are not usually equal -- hence the fitting problem we have here. Usually, the hourglass shape of the pattern does not pose a problem, because pullovers with waist shaping typically end above the fullest part of the hip. However, if the garment is hip length or longer, then this hourglass shape may not fit, and you'll need to make an adjustment like the one we're about to make. If your pattern lacks measurements or a schematic, you'll want to supply your own in advance of calculating your alterations. In fact, even if your pattern does have schematics, you might want to draw your own, anyway, in a larger size with more room for writing in numbers and dimensions. In fact, make two: one set labelled with the original dimensions of the chosen size of your pattern, and one with your target dimensions. Your schematics don't have to be to scale, they just need to be big enough to scribble on. 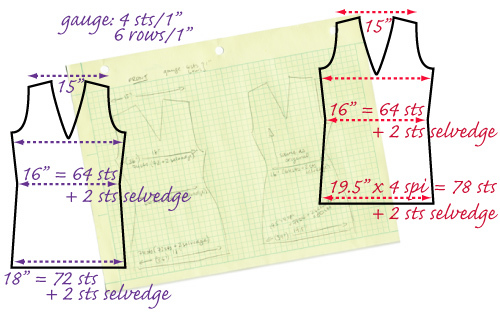 On your schematic with the original dimensions, run through the pattern numbers at the key points to calculate the original measurements: the beginning and/or end of each shaping zone, such as the wrist, bicep, hem, hip, waist, full bust, shoulder, and the neckline width, too. Also pencil in any finishing bands, like neckbands, and make a note of their depth; look at all those numbers, and compare them to the measurements you need to fit the wearer (taking ease into account). Make a note of the dimensions and the stitch counts at each point, according to the original pattern; if you're going to be making adjustments, you might as well write down your starting information now. Keep in mind whether there are selvedge stitches, which are incorporated into seams, or not; your finished measurements should not include the selvedge stitches, but you should keep track of those stitches as well. On your other schematic, write down your target dimensions. Your target finished dimensions should take the design ease into account, and figuring them out should be a simple exercise in arithmetic. In this example, the finished hip circumference will be too tight, so in keeping with the overall ease of the garment we've decided that we need to add 3 inches [7.5 cm] at the hips (our model's 38 inch [96.5 cm] hips plus 1 inch [2.5 cm] ease equals a total of 39 inches [99 cm], 3 inches [7.5 cm] more than the original pattern). When you sketch your schematics, don't forget to make a note of selvedge stitches. While they don't count towards the finished dimensions, you certainly need to remember them when you're knitting. For simplicity, not all measurements and stitch counts are shown in this diagram. Next, having figured out the target dimensions for the garment, it's time to figure out what to do to the pattern itself. According to our gauge in this case, 4 stitches per inch [2.5 cm], we're adding 12 stitches to the hip circumference to provide that additional 3 inches [7.5 cm] required. This translates to an additional 6 stitches for each of the front and back: each of the front and back now has 80 stitches (78 stitches plus 2 selvedge stitches), whereas the original pattern only had 74 (72 stitches plus 2 selvedge stitches). Having added in the extra stitches, there are a number of ways to decrease them to reach the original stitch count at the waist. You could convert some rows previously worked even to decrease rows (center; red dots represent new decrease rows), or you could convert some decrease rows to double-decrease rows (right; purple dots represent double decreases). The light red shading shows how the added width is gradually removed towards the waist. Because this alteration only requires a change to the region below the waist, we now need to figure out how to subtract these extra stitches by the time we reach the waist. Six stitches will need to be decreased on each of the front and the back; how they're decreased will be determined by how other decreases are handled in the same region. Depending on your pattern instructions, you may simply choose to insert extra decrease rows between the decrease rows already provided, or if the decreases are all single decreases (two stitches reduced to one), you might decide to substitute double decreases for three pairs of decreases on the front and back, as shown in the figure above. If the patterning of the fabric doesn't allow for additional decreases to be inserted into the existing (blue)pattern of decreases, then add the extra stitches at the edges of the piece, and decrease them at the edge of the piece as well. The above suggestion works for plain fabrics, but it's not always that easy, of course. Perhaps the sweater starts out with ribbing, or some other hem treatment that doesn't lend itself to the increased stitch count. Or perhaps the sweater is textured or patterned in a way that will be thrown off kilter by incorporating extra decreases into the existing line of decrease stitches. In that case, consider adding or subtracting stitches at the sides, for example in a background stitch (stockinette, reverse stockinette, or a texture or colour pattern with a small repeat). Again, with the fit model we used above, let's assume that now we want to fit a cropped, set-in sleeve pattern that's meant to fit with 2 inches [5 cm] of ease at the bust. 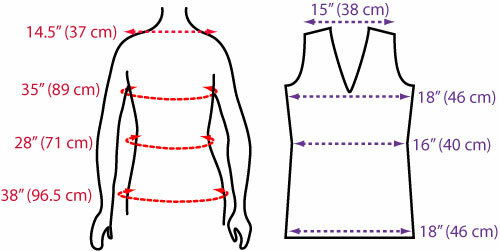 The closest pattern size has the correct bust measurement, but it's written for a woman with broader shoulders: while the sleeves are set in to the armscye and are not meant to be dropped, the schematic (and stitch count) tells us that the distance across the shoulders and neck is 17 inches [43 cm]. We happen to know that for this style of sweater, our wearer is happiest with a sweater with a cross-shoulder measurement of no more than 15 inches [38 cm]. 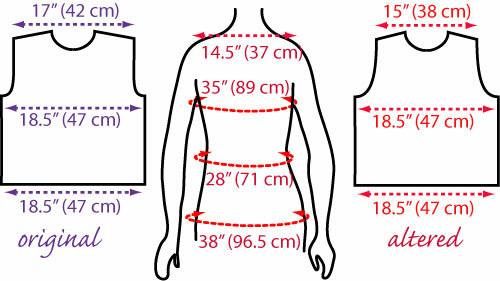 Based on these numbers, you can see that we need to reduce the cross-shoulder width of the garment by 2 inches [5 cm] on each of the front and the back, but without affecting the dimensions of the body from the bust area downwards. So, whatever changes we're making, we need to keep above the bust point. The original schematic (left), and the target dimensions (right). What our fit model (center) needs here is an adjustment that brings the cross-shoulder measurement in to the proper width, but depending on the original dimensions of the pattern, there are three different places where adjustments may be made. Depending on the overall shape of the garment front and back, an adjustment to the shoulder width might need to be made in a number of places. We need to identify where that extra cross-shoulder width is coming from: is it due to an extra-wide neckline or extra-wide shoulders? An extended shoulder (blue) extends the edge of the armscye past the natural shoulder point; a narrow shoulder (right) results in a narrower shoulder seam, ending closer to the neck. As a rule of thumb (which is as variable as all other rules of thumb), in a set-in sleeve style where the sleeve-body seam is intended to sit at the shoulder point, the cross-shoulder measurement will remain constant for a particular wearer regardless of the design ease. Naturally, there are exceptions; if a garment is intended to be worn over multiple layers, then the overall fit of the garment will be looser and additional shoulder room may be provided by extending the shoulder line past the shoulder point. If the garment is styled with narrow shoulders, then the sleeve-body seam may fall short of the shoulder point, for example at the end of the clavicle (like a tank top). But the rule of thumb does allow you to assume that the wider the neckline, the narrower the shoulders will be, and the narrower the neckline, the wider the shoulders will be. Typically, in a set-in sleeve garment where the sleeve-body seam falls at the shoulder point, the width of the shoulder seam itself (the seam that joins the front and back at the shoulder), extending between the shoulder point and the neckline, is between 4.5 and 5.75 inches [11.5 and 14.5 cm]. Some garments are intended to have wide necklines as a design feature. Thus, in a set-in sleeve garment with a wide neckline, the shoulder seam should be less than that typical range; if your schematic tells you that the neckline is wide and the shoulder seam is just as wide as a typical shoulder seam, then either the neckline must be narrowed, or the shoulders, or both. In order to determine whether the neckline is too wide, you'll need to compare the width of the neckline from the schematic to where it would fall on your body -- but don't forget about the neckline finish! If you included that in your schematic, then you won't erroneously conclude that the neckline requires narrowing when in fact the neckline, once finished, is just the right width. In this case, we'll assume that the neckline width is just fine, and that it is not in need of adjustment. 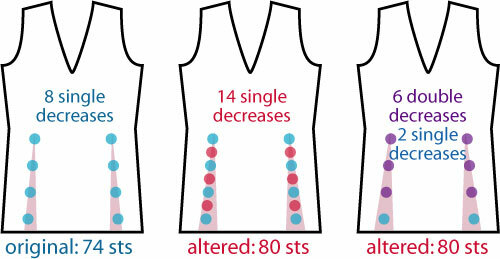 But if you do choose to reduce (increase) the width of the neckline without making any compensatory adjustments in the shoulders, note that you will not only reduce (increase) the cross-shoulder measurement; you'll also wind up reducing (increasing) the overall size of the garment below the neckline. 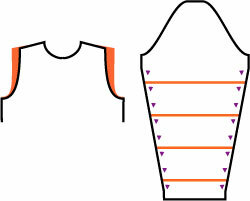 A garment with an extra-wide neckline (left) can be adjusted to bring its neckline width to an appropriate size (center), but this will result in a loss of width throughout the garment (indicated by the shaded rectangle at left). If this is not the intention, a compensatory adjustment must be made, for example by extending the sides of the body by an equal amount (shaded areas at right). 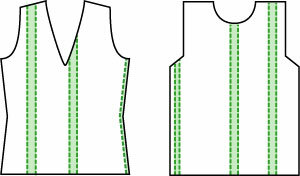 If the excess width is to be removed from the shoulder fabric, there are a few ways to do it -- which method is best depends on the patterning in the garment fabric, and whether any changes are to be made to the sleeve cap (or whether changes to the sleeve cap are to be avoided altogether). When faced with the need to decrease a substantial amount of width from each shoulder area -- here, 1 inch [2.5 cm] per side, in order to bring the cross-shoulder width from 17 to 15 inches [42 to 38 cm] -- the easiest solution might seem to be to simply decrease the extra stitches as quickly as possible, for example at the underarm bind-off or in the series of rapid decreases typically worked immediately after a bind-off in a set-in sleeve armscye. 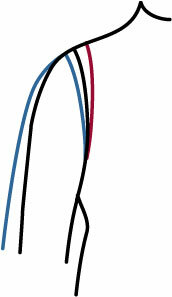 In the diagram below, this is the technique used in the far right-hand example: the original decreases are shown in blue, and the added decreases are red. In the far right-hand drawing, the added decreases are inserted into the bind-off, and very soon afterwards. Three different ways to decrease the shoulder width. At far right, the additional decreases (red) are inserted into the bind-off edge and in the rapid decreases following the bind-off; in the center, two ways of inserting the additional decreases that minimize the change to the armscye. The potential difficulty with this technique is that it results in a significant change to the shape of the armscye. While a change to the armscye is inevitable in this kind of width adjustment, altering the decreases in this manner results in the most extreme change. If you make this alteration, then you will have to consider what changes will need to be made to the shape of the sleeve cap: making the initial bind-off deeper and squaring the shape of the armscye will probably necessitate changing the initial bind-offs of the corresponding sleeve cap, and the perimeter of the armscye may be lengthened as well. Two alternatives are shown in the center example. On the side closest to the left, the additional decreases (red) are interspersed with the original decreases (blue), but the depth of the initial bind-off is not altered; instead, the decreases continue over more rows than they had in the original pattern (left-hand drawing). While the armscye is also reshaped in this example, the change from the original is not as severe as in the far right example; you may be able to get away with using the sleeve cap as originally drafted in the pattern; even though it will not be an exact fit, it will probably be close enough. The extra width that you removed (or added) to the cross-shoulder measurement may need to be added (or substracted) from the sleeve. In the center drawing on the right in the above diagram, the added decreases (red) are not incorporated into the armscye shaping at the edge at all. Instead, they are worked in the middle of the shoulder portion. As with the other example shown in the center drawing, the change to the armscye shape is minimized. However, this set of additional decreases may be more prominent, so unless you wanted to make these decreases a design feature, this method may only be suitable if the stitch pattern will help camouflage the decreases. However this alteration is made, though, you aren't finished yet. Because you have changed the cross-shoulder width, the wingspan of the garment (i.e., the measurement from wrist to wrist) will have been changed, as well. As a result, you may have to make a compensatory change to the sleeve length as well. This alteration would be made below the sleeve cap, for example by inserting extra rows between some of the increase rows of the sleeve (right). 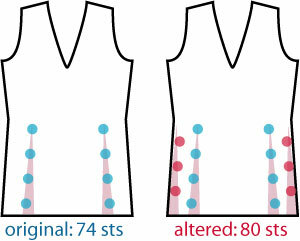 Next time, more examples of width adjustments: asymmetric adjustments to accommodate a full bust, and more alterations that affect the shape of the armscye and the sleeves. Snarly on the outside with a soft, chewy filling. Jenna would be a more productive knitter if her offspring didn't keep running off with her yarn or scribbling all over her pattern notes. Sometimes she blogs, and sometimes she finishes writing up patterns at her website. © 2007 Jenna Wilson. As with all Knitty content, you are permitted to print out a copy of this article for personal use. 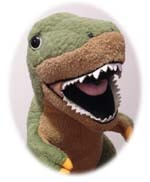 Shop owners and teachers may print out one copy directly from the Knitty website and store it in a reference location (e.g. a binder) for use by customers or students on the shop's or teacher's premises. Distribution of this article for use in teaching or shop environments is not permitted without the author's express permission. If you'd like your customers or students to obtain copies, they may get their own from the Knitty website. Contact Jenna.